Record Cold hits South Eastern QLD! Home/News/Record Cold hits South Eastern QLD! South East QLD has endured its coldest February period in more than 100 years, breaking several records, some of which are long standing! Above image via BSCH – live 6pm temperatures. South East QLD in Summer is typically warm, sometimes very hot, and muggy. Thats what it has been all Summer so far… until the last 2 days, which have seen the Seasons almost reversed with a return of showers, rain periods (mostly light in intensity) and COLD! The widespread thick cloud coverage, mixed with Southerly winds (mostly light over land, but very gusty off the Coast) and consistent shower activity has lead to the region recording its coldest February period in more than a century! The cold was kicked off on Friday (yesterday) with Toowoomba (15.4ºc), Stanthorpe (15.0ºc) and Warwick (16.9ºc) recording their coldest February days on record. 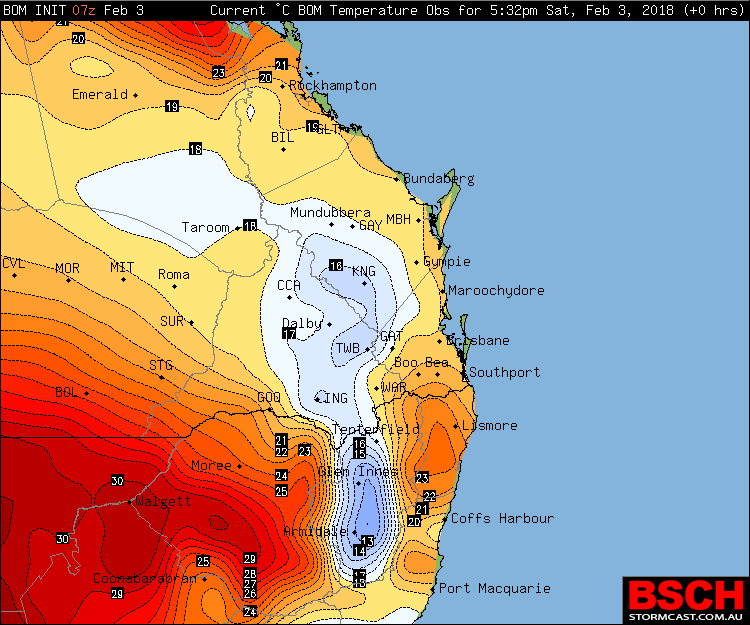 Brisbane, Ipswich and the majority of SEQLD struggled to get over 20ºc. Brisbane officially recording 21.7ºc. Saturday was even coldest for those East of the Ranges… Brisbane maxed just before 11am with a chilling 21.2ºc, this is the coldest February day since 1917 (101 years) and the coldest pair of February days (21.7ºc and 21.2ºc) since 1917 also. Today’s top of just 21.2ºc is actually colder than average for June, July and August in Brisbane! 11am temperatures and radar via Weatherzone for South East QLD. Amberley (20.3ºc), Kingaroy (18.0ºc), Oakey (18.4ºc), Redcliffe (21.7ºc), Beaudesert (21.0ºc), Gympie (20.4ºc), Gayndah (19.7ºc), Maryborough (21.3ºc), Gold Coast (21.2ºc), Nambour (21.0ºc) all recorded their coldest February days, with Dalby (18.5ºc) just 0.1ºc shy of the record set at the old station back in 1940 and Gatton (20.3ºc) just 0.2ºc shy of the current record. Tewantin’s 22.0ºc was only 0.4ºc shy of their record which is impressive given records date back to 1895! If Toowoomba didn’t break their record yesterday, then today’s feat would have anyway also. For the majority of people, its not just the cold… but the rain. The last 48hrs has generally seen more rain fall than all of January combined. 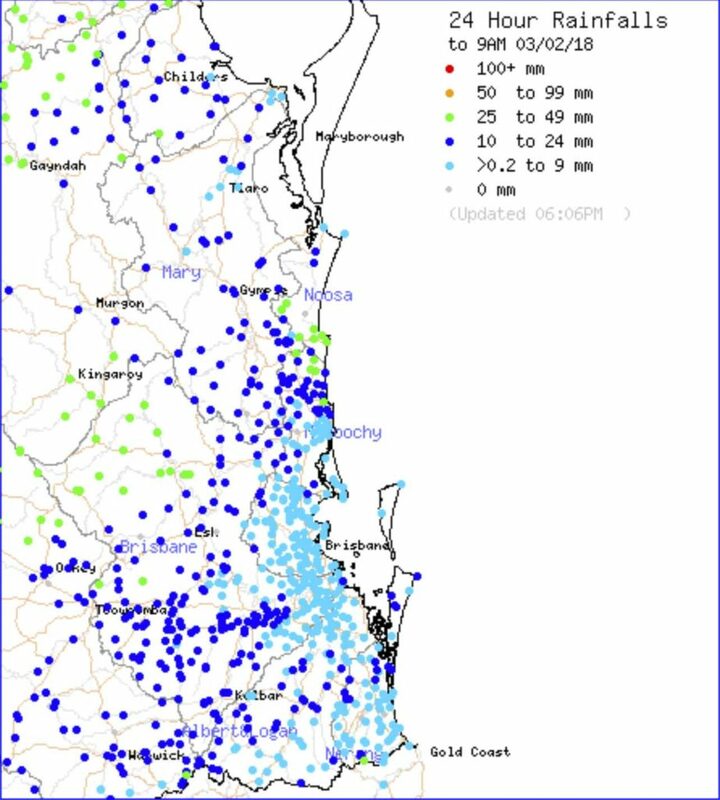 This has been most noted over places like the Darling Downs and Maranoa where falls of 50mm+ are becoming widespread, as well as the Sunshine Coast and Wide Bay. 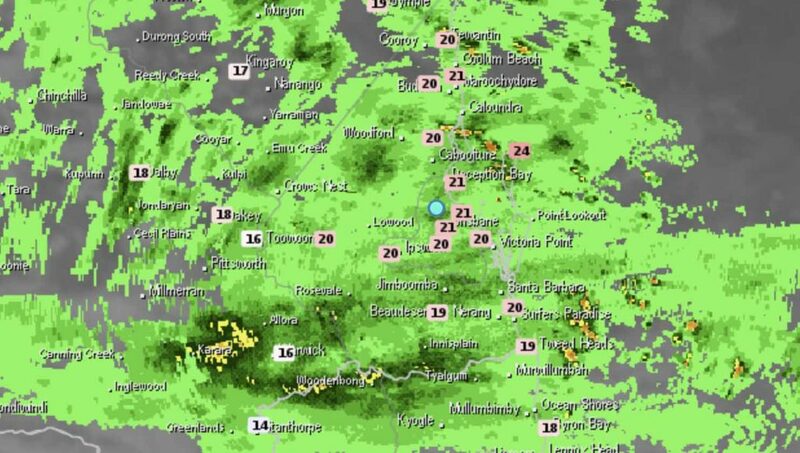 Places like Toowoomba who had a record dry January with 8mm, have already seen 30mm+.